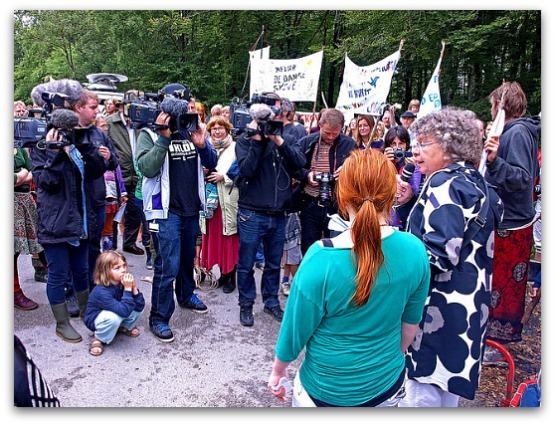 Thursday morning, 15 July 2011, the local Danish police gave up removing the activists who since Friday, 15 July 2011, have prevented the cutting down of forest to make room for the planned National Test Centre for 250 metres high windmills in Thy, Northern Jutland [Denmark]. Ten police officers turned up to end the blockade, but withdrew when it turned out that there were more activists than expected. 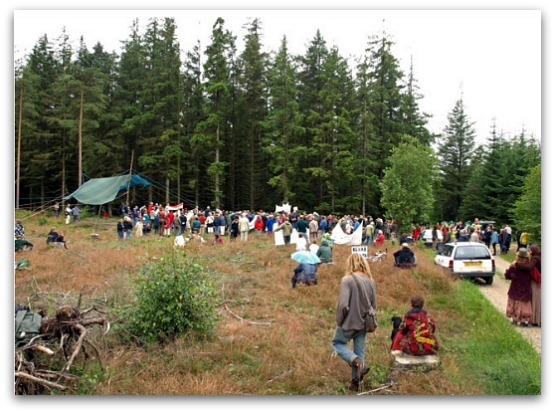 The protestors are camping in the forest area where the authorities intend to cut down the trees to create the right wind conditions in the Test Centre. “We shall be back in greater numbers,” the police said. The Test Centre will be situated between a protected bird sanctuary, a so-called Ramsar area, and a Natura 2000 area. 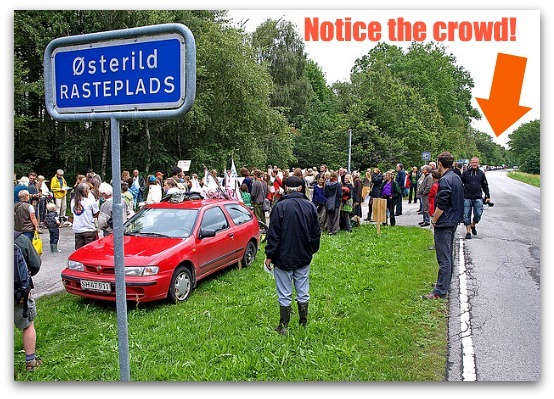 The Danish Society for Nature Conservation finds that the law regarding the Test Centre violates the European Union (EU) Habitat Directive, and has brought the case before the EU Commission who has requested a detailed statement from the Danish government. 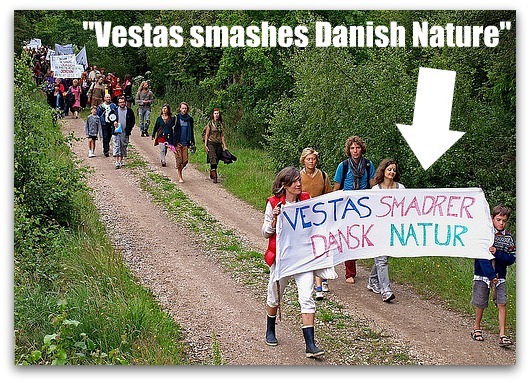 Furthermore, a local association has filed a case against the Danish State. 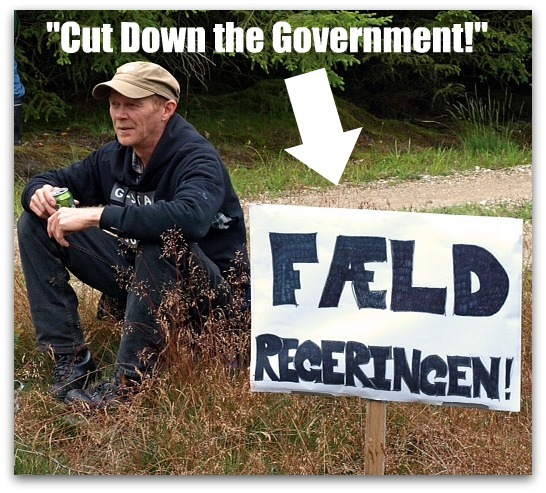 Friday, 15 July, the bird breeding season ended and by midnight the Danish authorities intended to start cutting down the forest. 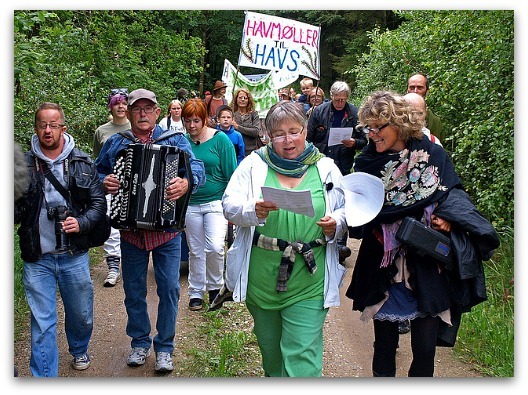 Throughout the day, the local population protested against the demolition of one of Denmark’s last wilderness area. The activists simply laid down in front of the authorities’ machines to prevent the cutting down to start. They are staying in the area in tents, day and night. The ruling of the EU Commission is expected within a couple of weeks. The activists demand that the cutting be postponed until the ruling of the EU Commission and the verdict of a Danish court have been made public. The Danish press is following the case every hour. An open letter from the Danish Association for Improved Environment to the Minister for the Environment was published today, requesting the Minister to stop the work. We find it very problematic that you, as the government’s representative, want to force through a very controversial Test Centre for windmills, when the most basic investigation of the negative impact on the surroundings have not yet been made. The demonstration in Thy has no central organization, but arose spontaneously. A spokesman for the activists appealed for support and assistance from both Europe and the rest of the world—support as soon as possible. Hooray for the Danes! Finally, someone with balls and ambition! Take note, world! This certainly dwarfs our action at Lincoln Lakes, but we had 50 people protesting the ribbon cutting ceremony for the Rollins Project that has desecrated and destroyed the Lincoln Lakes. Thus, the Danes inspire us to keep at it! It’s about time, too! Keep it up! Watch out, the rest of the world! We will not stand for this nonsense any longer! Critical mass has been reached. Rise up Ontario! We are apparently the Ground Zero of the wind energy question! Make your family war heroes of the past, who gave so much, proud to call you their own! 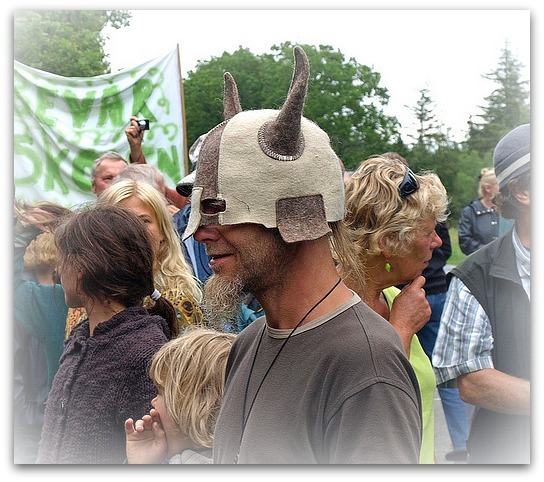 I have lived in Jutland for almost 5 years and I know that it takes a LOT before Danes take to the street. If the Danes revolt, it must be bad, *really* bad. Unfortunately, I live in Germany now, the “Land of Cowards,” as somebody recently observed: 16,500 wind turbines make vast stretches of land uninhabitable with a lot more to come. People I know develop late onset epilepsy, hypertension and other tell-tale symptoms since large-scale wind parks went up in their neighborhood and nobody is taking any action… I hope we can learn from the Danes. Hvilken skandale at ödelägge naturen for at ” redde den”. Interessant at alt foregår på vindkraftsfirmaernes prämisser. De har penge til lobby konulenter advokater osv, mens de der elsker naturen kunhar sig selv og må bruge deres fritid for at kämpe imod. Vindkraftboblen og de store möller kommer til at så som en skamstötte over nutidens politikere. Imperfect English translation: What a scandal that destroyed the wild in order to “save it.” Interesting that everything takes place on wind power firms prämisser (promises?). They have the money to lobby konulenter lawyers, etc., while those who love nature kunhar themselves and use their free time to march against. Wind bubble and the great Möller going to like a skamstötte of today’s politicians. 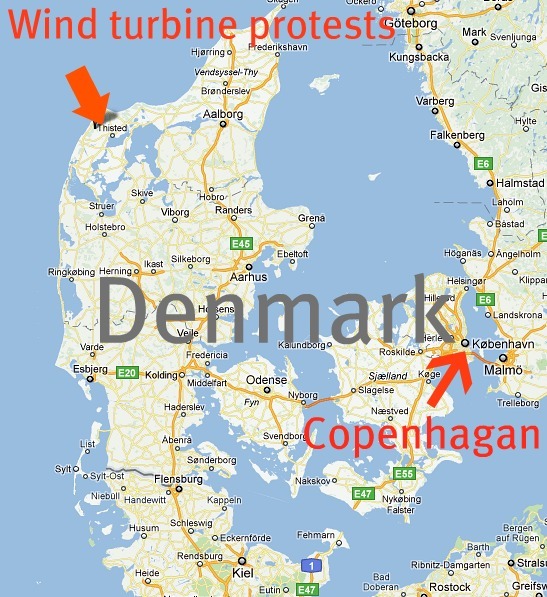 One member of our community group is from Denmark, and he said the media and government reports that the Danes are happy with the wind industry in that country are not true! Fight back! Editor’s reply: Be sure you read “Reality check on wind energy,” by Willem Post, for the scoop on what’s really happening in Denmark vis-a-vis Big Wind (Big Vestas). That hat? 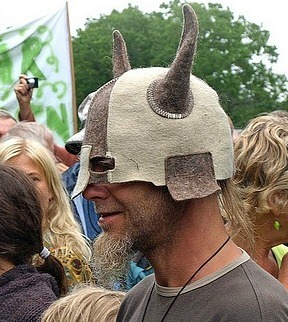 Isn’t that the sweetest headgear since the Viking invasions? 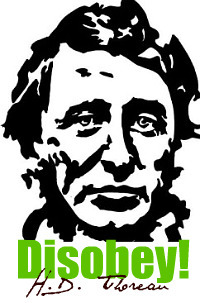 Wear that thing to the next (phony) wind developer public meeting! And let out a war whoop! Way to go you wonderful people of Denmark. WAKE UP AND TAKE NOTICE AMERICA. Get the green slime out of your eyes called money and pay attention to what these people are doing and why. Truth be told if Obama cared about the United States at all he would not be letting these monsters on our land. Ruining our country side, hurting our wildlife and causing physical pain and illness to it’s people. Not to mention the financial burden and BS. they might be awesome and amazing to look at but they are a trojan horse. You go Danes, thanks for being a wonderful example to the WORLD.